Dell PowerEdge RAID servers are an extremely popular data storage and networking solution for both small business and large enterprises. Because of the highly configurable nature of Dell systems in general, the Dell PowerEdge line of RAID servers come in a variety of configurations, such as 0, 1, 5, 6, 10. But the most popular configuration remains the RAID 5 configuration, and recently, with the 12th generation T, R and M series, the RAID 6 and 10 setups. No matter what configuration you may have, Dell PowerEdge disk and RAID problems do occur more often than you might think. These failures may originate from the PERC controller, or may be an issue originating from the condition of the hard disks themselves. Whatever the issue, the utmost care must be taken when these servers begin to generate disk error messages. 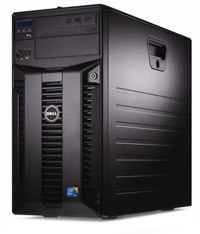 Contact us for free Dell PowerEdge help here. Hard Drive Recovery Group engineers have several years of experience with the Perc Controller family used by Dell PowerEdge servers. We keep a constantly-updated firmware library for the Perc system, as our Dell PowerEdge recovery services are probably the most popular of all our RAID services. Whether you are talking about a tower, blade or rack system, we can retrieve your files on your schedule, often within 24 hours of a call. Contact us here for a free RAID consultation. Experience counts in the hard drive recovery business, and nowhere is that more true than with RAID repair. Our proprietary software and technical expertise enables us to recover your Dell PowerEdge RAID system from almost any catastrophic crash. We have recovered servers of all sizes and configurations, and can tell you that as unique and unusual as your crash may seem, we’ve probably worked through one just like it before. Drive Drops - These systems have been known to drop two or more drives from the array container. Single Hard Drive Failure - While losing one drive will typically not kill a RAID 5 configuration, it can result in degraded performance, and can lead to a compromised system. Reconstruction Failures - Often, attempting to rebuild a drive once a RAID system has been operating with a failed hard drive for some time can be catastrophic and is not recommended. This is just one example of a PowerEdge error, but it is the kind of error that many administrators assume can be fixed with a simple rebuild. This is NOT always the case. In fact, an attempted rebuild with a failed hard drive can often alter the original RAID configuration, which can put the entire array at risk. Attempting to force a "failed" drive within an array back online is always a bad idea, and also puts the system in danger. This error, while uncommon, may suggest that your PERC Controller may need to be swapped out. Often, this issue is not actually the battery itself, but instead the card. In this case, calling a RAID specialist like Hard Drive Recovery Group or simply a Dell Support Associates is probably your best bet. One of the best tools for the administrator that encounters problems with his PowerEdge is Dell's OpenManage Server Administrator or OMSA. This toolkit can help you manage your PowerEdge, whether it's Windows, Linux or ESXi VIB. The program is available directly from the Dell website, but it is critical to remember that if you have no experience with it, and are experiencing a drive failure, it can also be quite damaging. Before you attempt to use OMSA, please call a Dell PowerEdge RAID recovery expert at the number above. One call will ensure that if you can rebuild the array, it will be completed in the safest way possible. The key to observing any issues with any Dell PowerEdge boot process is to insert the Dell Diagnostics diskette into the system, and make sure to reboot. Then, inspect the system. Is the power supply fan running? If it is not, it is very likely that this is the cause of your boot issues. After all, a non-functional power supply isn't going to allow any system to run. If your power supply is running, it is time to put your Dell Diagnostics programs to use. Once the program runs (which means it has completed a RAM check, and all is working perfectly), the diagnostics menu will appear. Once this occurs, there are three choices on the menu. Typically, we recommend the first selection, namely "Run All Tests". This should reveal quite a lot with regards to hardware errors, and any output can be very valuable when dealing with a data recovery engineer. Make sure to take notes. While the newer generation PowerEdge models such as the T, R and M series are servers we commonly work with, older generation PowerEdge models, such as the 850, 860, 1800, 1850, 1900, 1950, 280, 2850, 2900, 2970, 6800, 6850, and 6950 series are far more susceptible to failures, simply because of their advanced age. These model numbers make up the bulk of our recoveries, and have become a "specialty within a specialty" for us. Rest assured, if you have a disk problem with one of these models, we have the solution. Hard Drive Recovery Group RAID specialists offer both hardware expertise and in-depth software knowledge to every job, which ensures an almost 99% success rate. Our clients have experienced some of the highest data recovery rates in the industry, and continue to return to us. If your Dell PowerEdge RAID server has crashed, consider a professional opinion first. Contact us here, or at the toll-free number above. Click here to request a free RAID data recovery quote.